October is Breast Cancer Awareness Month or BCAM. Although I promised Halloween nail art ideas for the whole month of October, I could not resist not creating a nail design to help promote breast cancer awareness. It is important to know about this illness and I hope with my blog, I'll be able to take part in this campaign. Last year, I also came up with a pink nail design for the same purpose. You can view it here. Details regarding the nail design will be discussed on a separate post as I want this entry to focus on the health campaign. The BCAM is an international health campaign. It is organized by various organizations to help spread knowledge about breast cancer and to raise money that will be used for further medical research. The ultimate objective is to remind women that the earlier the cancer can be detected, the higher the probability of curing it. To achieve this, we must be knowledgeable on its symptoms and how to detect them. According to doctors, women should start self-examination of the breasts as early as 20. By 40, women are advised to have an annual mammogram screening. I found a site called National Breast Cancer Foundation, Inc. that you may find very informative and useful. The site includes tutorials on how to self examine breasts, myths about breast cancer, symptoms, and other pertinent data. 1. The Estée Lauder Companies are currently selling Pink Ribbon beauty products to help raise funds and promote awareness. Join their Facebook Page to share your message of hope through their simple application. 2. 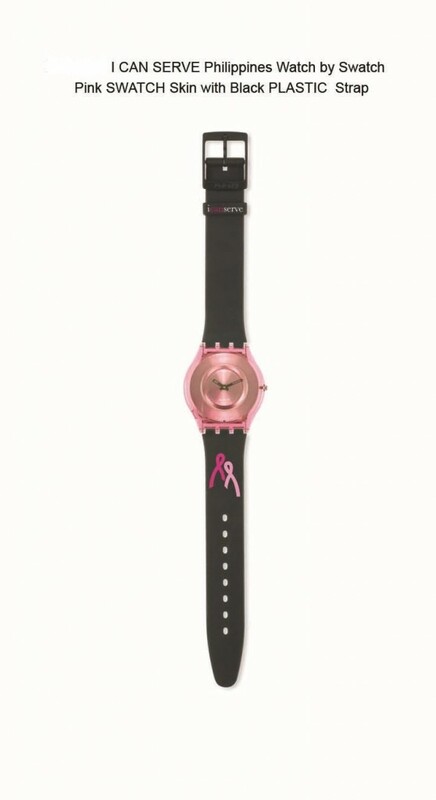 ICanServe Foundation has collaborated with Swatch and came up with the ICanServe Watch. It is available for Php5000 ($113) in all Swatch outlets in Manila, Cebu, and Davao. The foundation website is rich in information about breast cancer and includes helpful videos. Prevention is always better than cure. Let's all take the initiative to spread this campaign to our family, relatives, and friends. I hope you enjoyed the nail art despite the seriousness of this post. On the lighter side of things, I actually was surprised to have found a good number of pink nail polishes on my stash to use for this nail design. I love that! So cute and simple, very wearable. Lovely manicure! Early detection is also important, so do those self exams and get regular mammograms. My mom found a lump two years ago, and I am happy to say that she is now 1 year cancer free! She found it during a self exam. Feel your boobies! :) Save the Tatas! Yes, we can never be too careful. I am a doctor, but it never occured to me to use my nail art to promote BCAM until I saw your post! Thank you, Rins, and may God bless you more. I'd like to participate in this health campaign in ways that I can.